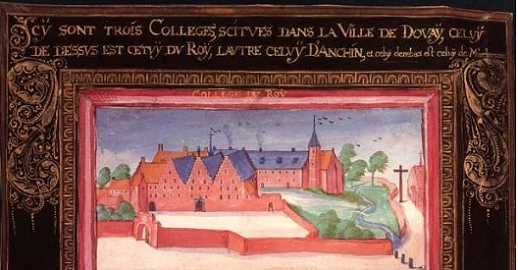 In the late sixteenth and the early seventeenth century Catholic refugees from the British Isles, Ireland, France and the Dutch Republic found refuge in de archdiocese of Cambrai, on the southern border of the Habsburg Low Countries. This created a remarkable climate in which refugees along with locals battled for the Catholic religion. It is widely acknowledged that under similar conditions of exile, protestant refugees swiftly used the printing press in order to spur a transregional identity among coreligionists. This PhD-project, within a wider project funded by the Research Council KU Leuven, contends that printing was vital to any early modern confession and, therefore, will analyse how in Cambrai print culture functioned as a crucial variable in ‘the making of’ a transregional religion. The research focusses on two interrelated aspects. First, the study of the socially and regionally diverse members of the printing business will explain how immigrants and locals interacted to forge Catholicism. Second, by means of the study of a selection of martyr narratives, it should become clear which readerships these books aimed and if different exile communities also preferred other martyrs. A. Soetaert, ‘Printing at the frontier. The emergence of a transregional book production in the Ecclesiastical Province of Cambrai (ca. 1560-1659)’, in: De Gulden Passer: Journal for book history, 94 (2016), 137-163. V. Soen, ‘Exile encounters and cross-border mobility in early modern borderlands: the Ecclesiastical Province of Cambrai as a transregional node (1559-1600)’, in: Belgeo : Revue Belge de Geographie / Belgisch Tijdschrift voor Geografie / Belgische Zeitschrift für Geographie = Belgian Journal of Geography, 2015, 2 (2016), 2-13. A. Soetaert, V. Soen, and J. Verberckmoes, ‘Verborgen meertaligheid. De katholieke drukpers in de kerkprovincie Kamerijk (1560-1600)’, in: Queeste: tijdschrift voor middeleeuwse letterkunde in de Nederlanden, 22:1 (2015), 62-81. A. Soetaert, ‘Translating and distributing Italian religious literature in the ecclesiastical province of Cambrai (1563-1659)’, in: Incontri: Rivista Europea di Studi Italiani, 22:2 (2015), 29-40. Welcome to our website! The Research Group Early Modern History at the University of Leuven here presents its different projects on transregional history. We argue that the method of transregional history offers a valuable new tool for studying early modern territorial borders. Where existing research strands do not always suffice to accommodate the complexity of such boundaries, this new concept can serve as an alternative. In doing so, transregional history helps to reformulate questions about territorial boundaries, to make novel heuristic choices in research where and when borders matter, and, hence, to improve our understanding of transboundary historical change.